Semenov, Yuri Pavlovich. Born in 1935. Joined Sergei Korolev's OKB-1 in 1964. Since 1989, Semenov had served as Designer General of NPO Energia, currently RKK Energia, the developer of Russian manned spacecraft. Russian government sent him to retirement on May 28, 2005. 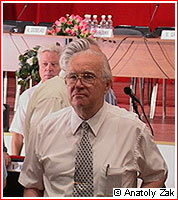 Yuri Semenov was born on April 20, 1935, in the town of Toropets, Kalinin (Tver) Region. He graduated from Physics and Technology Department of Dnepropetrovsk University in 1958 and got his first job "right in town" at OKB-586, known today as KB Yuzhnoe of Dnepropetrovsk, a major producer of long-range ballistic missiles, launch-vehicles and spacecraft. In 1964, Semenov transferred to Sergei Korolev's OKB-1, known today as RKK Energia. He quickly rose in ranks becoming Deputy Leading Designer of the Soyuz spacecraft, and later a Leading Designer of the L1 spacecraft, and the orbital space stations. In 1972, Semenov was appointed a Chief Designer of the manned spacecraft and orbital stations. Form 1977, Semenov led the development and the implementation of the Soyuz, Salyut and Mir programs. Semenov was known as shrewd, but outspoken leader, who used both strong will and political connections in the unending struggle for government funding within the Russian military industrial complex. He (and, apparently, his connections) were instrumental in wrestling the control for the Soviet space station program away from a rival design bureau led by Vladimir Chelomei. With the disintegration of the USSR in 1991, Semenov was quick to establish personal contacts with leaders of the US and European space industry, which later helped RKK Energia to win a major role in a number of cooperative space ventures between Russia and the West, first of all the International Space Station and the Sea Launch. In the post-Soviet uncertainty, Semenov often presented NPO Energia as the "Russian space program," dismissing newly created Russian Space Agency. Semenov also oversaw a pragmatic move to jump-start a potentially lucrative business of communications satellite development at RKK Energia. At the same time, in mid-1990s, Semenov failed to prevent his main rival in the industry -- Khrunichev enterprise -- to squeeze RKK Energia out of participation in the development of the new all-Russian launcher dubbed Angara. Semenov also fought an uphill battle on two fronts with the Russian government and partners at NASA to keep the Mir space station in orbit. Ultimately, he had to oversee the deorbiting of the legendary outpost's in March 2001. However he refused to bow to the US pressure to bar paying passengers from visiting the International Space Station, thus helping an early start the "age of space tourism." Despite a mixed picture of successes and failures, the overall financial condition at RKK Energia remained perilous. The company officials complained for years about government's failure to provide adequate funds for the manned space program, while Energia's venture into the satellite launching business and satellite communications was hit by post-2000 worldwide economic decline and by technical failures of RKK Energia-built Block DM upper stage and Yamal comsats.